CONCORD, Calif., June 14, 2011 (SEND2PRESS NEWSWIRE) — Gold Pan California (www.goldpancalifornia.com), a gold mining supply shop located in the Bay Area, has recently become the California headquarters for suction dredge gold miners whose industry faces permanent closure if 2 paragraphs of erroneous language are not deleted during the current Budget battle. 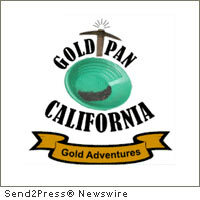 “We are trying to alert the Legislators and Governor Jerry Brown about this erroneous budget information before a death blow is dealt to the miners,” says Gold Pan owner Mike Dunn. Dunn says that the California Tribal Business Alliance (CTBA) and Friends Of The River (FOTR) provided outdated financial information to the consultant preparing this year’s budget for the Department of Fish and Game (DFG), in order to show a “deficit” which could be offered as a “budget cut” to the suction dredge gold mining program. The CTBA and FOTR were also backers of the 2009 legislation SB670, which caused a temporary moratorium to be placed on the practice of suction dredge mining until an Environmental Impact Report was conducted. In February 2011, the draft EIR was released by the DFG, who is on track to re-instate the program this November. Not happy with the EIR outcome, the CTBA and FOTR went to Assemblyman Jared Huffman (D-San Rafael) and suggested a “budget cut” to the suction dredging program. They supplied the old budget analysis from SB670 which was drafted using estimates of costs of the program. The Program was later formally determined to be solvent, with declarations provided by Attorney General Jerry Brown’s office. A second, more precise communication to the Court from Jerry Brown’s office states “In no uncertain terms, General Fund Monies have not been expended on suction dredge permitting”. “At a time when California has a budget deficit of over $10 billion dollars, why are environmentalists and a few Indian tribes trying to further damage California’s economy, especially in the rural areas which have been so hard hit by the economic downturn?” Dunn asks. If the legislation passes, the consequences would be sweeping: 4,000 miners will be out of work, 15,000 inter-related jobs will be affected, and the suction dredge gold mining industry will be killed. Additionally, California will lose $23 million annually, and will incur new litigation expenses, since Federal mining rights would be infringed upon. Last week, the first federal lawsuit was filed against the State by a miner who believes he is standing on firm ground. Trying to alert the Legislators and Governor during the final hours of budget negotiations is a daunting task, “but the disaster awaiting is even worse,” says Dunn. Hopefully, former Attorney General Jerry Brown’s legal findings will be seen in time to avert a disastrous end to the industry that put California on the map. Original Keywords: international gold mining specialist, suction gold dredge mining, Mike Dunn, Proline, California Tribal Business Alliance, Friends Of The River, suction dredging gold mining program Gold Pan California Concord California CONCORD, Calif.
REFERENCES: Ballots Bills and Laws News, international gold mining specialist, suction gold dredge mining, Mike Dunn, Proline, California Tribal Business Alliance, Friends Of The River, suction dredging gold mining program Gold Pan California Concord California CONCORD, Calif.